Welcome to another episode recap of The Block! Anyway, in this week’s episode Deanne and Darren Jolly switched the locations of the dining room and kitchen. Easy enough, right? Wrong! 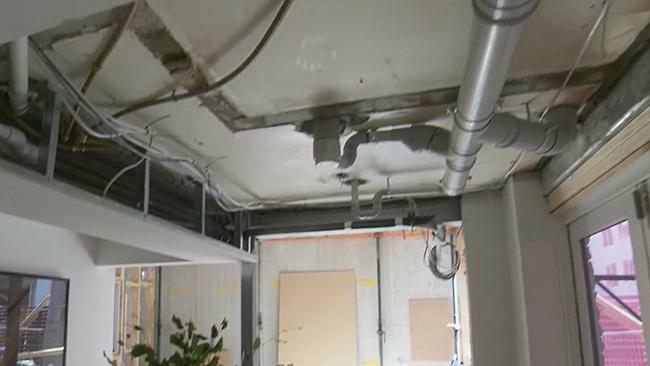 This really messed up the pipework, (for example, drain pipes for the bathrooms immediately above that location), resulting in dropped or protruded pipes from the ceiling above. The ceiling lining could only be installed at a height that allowed for the pipes. Basically, this was going to make the room’s ceiling lower than allowed in a habitable room. Yes, there are rules for this! What is a habitable room? And why should I care about ceiling heights? Rooms and their uses are specifically defined in the Building Code of Australia, the rule book for building in Australia. Things like the mandatory ceiling heights differ depending on the type of room and its intended use. You may have heard the term ‘habitable’ bandied around. For example: a dining room, like a living room, is considered a ‘habitable’ room because you spend a lot of time in there. This means the ceiling has to be a certain height for safety reasons. This is compared to a room like a kitchen, which can have a lower than standard ceiling, as its inferred that you don’t spend much time in there apart from whipping up some food. In terms of Australian way of life, the definition has a bit of catching up to do. We don’t all gather around the dinner table every night, followed by more family time watching TV. The times, they are a’changin’! If your family is anything like mine, we have to work hard to sit down for a family meal at the same time. Because of this, we’ve mandated just Thursday and Sunday nights for this special time. Otherwise, our schedules mean we usually eat at the kitchen bench, or the kids eat at the bench first, and then parents eat dinner on their laps in front of the TV or computer much later. I would argue that my ‘dining room’ is far less frequently used than the kitchen, and thus the more often habit-ed room is actually the kitchen! But changing the code would be like turning the Titanic blind-folded. So until the code catches up, Dea and Darren were stuck with the unintended consequences of their decision. Who was to blame for this tall mistake? Much was made of the blame game in this week’s episode. Everyone from the architect, to the plumber, to the foremen, and Dea and Darren themselves, were all in the firing line. If you hadn’t noticed, decision making on The Block is not as clear-cut as in a standard job. With a standard renovation managed by an Owner Builder, the blame would rest with them. If a Registered Builder were engaged, the blame would rest with them. If an architect or engineer had been engaged and it was their idea, , they would be to blame. The unlikely and unappreciated hero this week was Interior Designer Shaynna Blaze. Shaynna had wrangled all of the key parties into a room to come up with a solution. In the end it was a pretty significant compromise involving ‘chasing in’ or recessing part of the pipe work into the slab. To ‘chase a pipe in’ is to cut a groove or recess into the concrete slab above their heads and fit the pipes into this space so they don’t protrude so much. Throughout this season ‘chasing in’ has been avoided because the slabs between the floors of the apartments are actually quite shallow. This means their structural integrity can be compromised by cutting into them. If you cut into them they would be weakened and could collapse. It would have to have been a “Deemed to Comply” solution or an alternative solution that they managed to get their Surveyor and Engineer to sign off on. This is when the builders consult the Building Code when they have come up with a novel solution to a problem to assess whether the novel solution still meets the intentions of the Building Code. All this could have been avoided if they’d just downloaded the Building Code of Australia! Did you know that you can download the Building Code of Australia for free? Yes! I can see you all rushing to download it now! NOT. If you are a serial renovator and you are in a quandary about deemed to comply arrangement’s, alternative solutions and the Code’s requirements, you’re in luck. This is the first year that State Governments decided around the country that more people would probably comply with the Building Code of Australia if it didn’t cost hundreds and hundreds to buy a new edition every year. However you do have to register to receive it. Register anytime between 1 February 2015 to get a free preview of the BCA (also called the National Construction Code) online and in PDF format. Keep your eye on the thrilling ABCB website and it should be available from the 1st May 2015. This is a huge benefit, as the Building Code changes all the time and previously you had to update your editions annually at a significant cost. The governments finally got their act together and figured code compliance would go up if this significant barrier were removed. Whatever will I prop my monitor up with now? So go nuts and download it, but if the thousands of pages of code scare you off, here again is a handy cheat sheet on some of those critical measurements every renovator and tradie must know off by heart. Room Sizes: Basically its about keeping the occupants safe from injury and to ensure you enjoy and can use the space, it generally falls under Part 2.4 Health and Amenity. Over to you: do have a copy of the Building Code of Australia? What rooms do you spend most of your time in? Let me know in the comments below!